You probably have all-purpose flour stowed away somewhere in your kitchen. All-purpose flour can be used for just about any recipe and is available as bleached or unbleached. Unbleached flour does not have as nice an appearance as bleached flour, but it has been exposed to fewer chemicals. Using unbleached flour instead of bleached flour doesn't have any major risks, but can make a difference in quality of some baked goods. Flour is made from soft wheat or hard wheat, but the distinction is in the amount of protein. All-purpose flour, whether bleached or unbleached, is made from soft red winter wheat, hard red winter wheat or a combination of both. Carotenoid pigments in fresh milled flour give it a yellowish hue that fades naturally over time, leaving unbleached flour with an off-white or very pale yellow color. Manufacturers whiten bleached flour with chlorine or peroxide to speed up that process and to give it a brighter white appearance. Any refined flour, including unbleached flour, is a refined grain. Refined grains are milled to take out the bran and germ of the wheat kernel, leaving only the endosperm. The milling process gives flour a nicer texture and an extended shelf life, but it also removes fiber, B vitamins and iron. 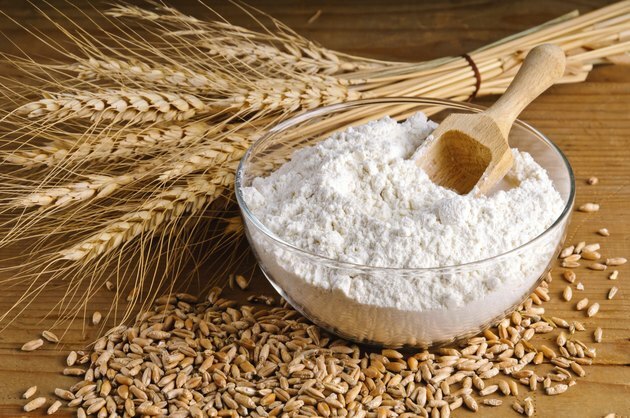 Enriched bleached or unbleached flours have B vitamins and iron added back, but not the fiber, so they contain less fiber than whole grain flours. The U.S. Department of Agriculture recommends getting half your grains as whole grains. Fiber may lower cholesterol levels and your risk for obesity, heart disease and Type 2 diabetes. It also prevents constipation and fills you up with fewer calories. Unbleached flour has a higher protein content than bleached flour, which makes the unbleached flour harder. By using unbleached flour, you risk serving baked goods that are not as soft and tender as those made with lower-protein bleached flour. They will also have a duller color because of the pale, off-white color of the flour. With most cookies you won’t notice a difference. If, however, you are making an angel food cake, your cake won’t be as soft, white and light if you use unbleached flour instead of bleached. To get the most nutrients and fiber from flour, opt for whole-wheat, enriched flour. If you are concerned about baking with denser whole-wheat flour, try mixing whole wheat and white flour until you find a blend that works for your needs. When stored correctly, all-purpose flour can be kept for six to eight months. Make sure all the air is out of the bag before folding it, and keep it in a container with a secure lid. Flour absorbs odors easily, so store it away from onions, dishwasher soap powder or other strong-smelling foods or products. Flour can also be kept in the freezer to extend its shelf life. USDA ChooseMyPlate.gov: Why Is It Important to Eat Grains, Especially Whole-Grains? Baking Bites: What Is Unbleached Flour?